2 to 3 Club manipulation. Ways to manipulate clubs without knowing how to juggle. All Levels. Bring Clubs. This workshop will focus on establishing a range of speed at which movement can happen, and then collectively exploring that range to create a dynamic and engaging group experience. This simple but powerful technique is applicable to improving numerous elements of performance, group choreography or your own personal practice. This workshop will be focusing on some very useful fundamental Tai Chi exercises and principles and how to apply them into spinning for a more relaxed, grounded, mechanically aligned, and fluid style of movement. This moderate to advanced poi workshop will explore how by driving the momentum of the poi with the lower body, using a dynamic range of speed, and body tracing, one can dance more freely without the rigid limit of monotonous planes and body tension. This will be a workshop about my thought process when building a sequence of tosses contact rolls negative space etc. and how to use those in choreography. Last year I taught the basics of contact club at a few festivals. This year I’m moving onto some more advance techniques involving steves, chi rolls, chest rolls, hand rolls,and a few balance points. Here we will go over the absolute basics to get you geared up to start learning contact juggling. In this course, students will get a full breakdown of 2-4 ball multiball, proper speed control, and a whole range of new moves and concepts to work on. In this course, we will talk about basic isolations and patterns with 2 hoops. A prior understanding of hoop isolations is encouraged for this course. I would like to do a workshop on double staff contact ideas and exploration. The content will be some recent ideas I've been working on since last summer. Combining some wall plane tech with angel roll, halos, and other things of that nature. Single staff angel rolls, fishtails, halo 360, Jesus moves. This class will take a look into the process of syncing together multiple driving styles in order to come up with unique sequences. I will explore manipulation ideas to solidify in each hand and basic to advanced tosses to combine with these manipulations. The key to making a creative "trick" is becoming comfortable enough with small yet complicated movements that can be put together to create a larger, macro movement. This class will explore the glory of multiplex theory in manipulation juggling and small throws inside simple concepts that can allow you to move and express your body outside of the standard "rooted feet" syndrome that befalls many performers. I will teach basic ways to get in and out of different multiplex formations and the theory behind them along with small manipulations for your free hand to combine in time with the actual multiplex throws for a more well rounded sequence. I will also explore small transitional throws that can give the illusion of harder movement skills such as a single pass behind the head to the same hand to allow you to gracefully turn to the right or left in between juggling sequences. The flower is a basic concept with unlimited possibilities. This beginner workshop will give its attendees an understanding of creating flowers, focusing on the postures and movements required to perform them safely and cleanly. We will begin with an explanation of prospin petal creation, and an introduction to antispins. Then students will drop their poi for a lesson in arm movements and posture, noting timing and direction combinations. Finally, we will combine the two concepts, leading the class into 2-arm simultaneous flowers in the wheel planes. Some of the most memorable moments in a poi routine are created by stalls. They punctuate the flow while demonstrating a high degree of control over your prop. This class will introduce beginners to that world. We will begin with an explanation of the physics theory behind them, and move into drills that will help a spinner develop precision with different variations. To finish the class, several combos will be illustrated and incorporated into flow with a focus on footwork and body movement. How to fishtail a poi, I highly recommend using contact poi! We we cover weaves, butterflies, supermans, fantastic fours, and a few tosses. This will go over the Halo, Jesus, and Angel Roll separately, then start working on putting them together to complete the Holy Trinity. The class will go over basic arm paths, timing/direction theory, and club hybrids. Dance is one of the best ways to transfer inner emotions into the physical world. It can be a healing tool for those who experience trauma, crisis, or loss, or it can be a way for some to capture and harness moments of utter joy, love, and excitement. Whether it is to share an experience with viewers or for your own personal release, the ability to tap into your deepest feelings while moving is an invaluable tool for any mover. We'll do some meditative movement exploration, some intention setting, and use dance therapy techniques to reach within and create with meaning. "Life is not a destination, but a journey." When it comes to movement there are no rules. So where does one begin? This workshop will help you build your own toolbox for adding depth and dynamics to your creative process. These ideas will help to set structures for both choreography and improvisational performance. We'll play games, explore ideas, and discuss devices that make the creative approach more interesting, and of course, more fun! This workshop will share the elements of composition to better equip flow artist for integrating composition and choreography into one's practice and performance. Topics covered will include: how more efficient movement is derived from heightened kinesthetic awareness; movement exploration in both self and general space separately and in combination; understanding intentions along the spectrum of first and second function according to F.S.C Northrop; utilizing body shapes and negative space; how to envision and composite a performance as a whole unit using tools such as spacing, repetition, and motifs, along with relationships towards other performers, one's prop, and the audience; plus guiding and structuring improvisation through stochastic processes such as action words, mental imagery, and self generated information design. This is an interactive workshop that begins with a brief open discussion to see where we all are energetically as a group. Then I journey begins. I will lay out a basic outline for what everyone will all be creating (a spaceship within ourselves is the idea) by everyone shaping this idea in what they perceive to be the best, the highest light & most preferable for them within their imagination. Then we will shift into being this idea we have created effectively fueling everyone's own creative fire. During this process I will be aiding in releasing any energetic charges that no longer serve us. This meditative visualization technique allows us to play freely with our purest imagination & will play along well with the creative energy that Flowstorm & this amazing community create & present. Hopefully this class will inspire & spark the the creativity & curiosity natural to being. Helping everyone to look within ourselves to move in a positive direction & live in our dreams & desires. What do Bruce Lee, Michelangelo, and Napoleon Dynamite have in common? Nunchuck skills! This beginner workshop will teach you the basics of freestyle nunchaku, a style more decorative than traditional combat nunchaku. Grasshoppers will leave this class with the foundation to build your repertoire of moves and the speed to play with fire safely when you're ready. To finish the workshop, I will show you how to tie airport loops and pass off fire nunchucks as torch poi so your ""deadly weapons"" will be legal for travel in the air and on the road. The leading concept being 'proprioception,' or, one's body in relation to space and time. This concept can be expanded to many other aspects and variations of hoop flow, as well as other props. Inner and outer space, timing, and contact discussion would be delved into, and of course played out with our props. In this workshop we will be exploring the relative transitions that apply to Quarter time drive form, both in Forward Same time and as well as Split Same time. Will be an intermediate hooping workshop that will focus on off body pattern building with twin hoops. We'll start the workshop off with a breakdown of anti-spins vs. in-spins as flowers and caps and go through variations and multiple directions. From there we'll go through a brief discussion on the defining aspects of hybrids and talk about what in hybrids we'll be covering in particular; Hand 2 Hand hybrids. The main one we'll start with is the well known Isolation vs. Smear and then go over a bunch of fun variations. The workshop will finish up with 3D Antispins inspired by fan tech and 90 angles and pattern building. We'll learn to use dreams as inspiring tools for waking life empowerment, life style pattern analysis and completely legal hallucinogenic vision questing. Topics include lucid dreaming, dream journaling, personal symbolic mythology, mapping the subconscious realms, using improvisational stochastic processes / divination to unlock hidden potentials and using edge realm focus as a flow art within itself. Attendees encouraged to bring writing or drawing materials. Pillow optional. I had a lot of fun teaching the beginner class last year. I have 10 unicycles, which means 20 people can be in the class. Beginners will need at least one partner to help them learn how to ride. This is such a fun challenge, even for the advanced flow artist and the ones with the most balance. I can also teach more advanced people, if there are any. How to start them and what to do at each stage. How to make microgreens sustainable. The benefits of young vegetables and sprouting legumes and grains. This workshop covers the isolated pendulum and it’s uses in various hybrids and patterns to create a very different aesthetic than much classical spinning. This class teaches how to turn mistakes into moves, anticipate the music and to be aware of the terrain, in order to use it to your advantage and better align your flow with your surroundings. Interacting with your tool: this is a lesson in meditation... it teaches the flow artist to tune out what is going on around them to better focus in on their own relationship with the movement of their tool... this allows the spinner to be more relaxed in a public atmosphere and noticeably enriches the spinner's flow. Breaks is a practice that involves using your breath in connection with your hoops rhythm, particularly with breaks and reversals. There's several breathing patterns and exercises that connect incredibly well with the hoop. We also explore the inside and outside space of the hoop to help gain control and precision with the techniques involved in the practice. Most everything in life follows one simple rule that I call the rule of moderation. I want to touch on a few points of balance including balancing your life around you, your inner thoughts and feelings, and focus heavily on bodily balance. I encourage everyone to bring a personal exercise ball with them though they are not necessary for the class. Also if anyone is able to bring more than one exercise ball to share with others that would be amazing! -Rigging: Different ways to hold your long string flow wand. -Wraps: How to wrap the long string with the body. -Changing Direction and Momentum: What to do once you're all wrapped up and how to get out of it. -8 Counts and Arms: Using 8 counts to structure flow and understand timing to create illusions. -Spin Spin: How to avoid getting dizzy by focusing on the wand and using spotting. -Get Funky With It: Fun tricks and understanding hand positions. Learn how to propagate the bounty of nature by using seeds, stem cuttings, and root division. We'll cover basic methods and low maintenance techniques that anybody can do. In this workshop, pupils will be given guidelines and techniques that will inevitably help them transcend the omnipresence of flow through musicality. With a main focus on hand hoop manipulation, pupils will use their bodies to create series of moments while simultaneously using learned hoop techniques to visually connect the worlds of ethereal fantasy and technical hoop skill on a 2D and 3D plane. Basics and Beyond! All skill levels welcome. Learn to fine tune your training time to get the most out of every session. All skill levels welcome. Very limited extra sets of buugeng available. -Finishing the sentence, "I am myself when..."
-Creating a personalized stretch routine. An all inclusive workshop that caters to all levels. We break down basic to advanced partner moves and discuss how we use the various principals to integrate choreography and produce an act. Partner juggling for all levels. One barely has to be able to carry a cascade and can try partner juggling! For the more advanced we can share tricks in 2, 3, and 4 count patterns and more. A single flap of a butterfly wing can leave momentous ripple effect on all of existence. An exploration into some variations of a FUNdamental poi move, the butterfly. Get your body spinning with this exploration into basic 3rd dimensional patterns utilizing the Octahedron. Toss aside rigidity and learn to integrate free-flowing movement into your ball juggling! This workshop is geared toward beginner and intermediate toss jugglers. The first half of the session will focus on concepts and techniques applicable at both skill levels and the second half will teach specific tricks and patterns at the advanced-beginner and intermediate level. A basic introduction to Permaculture earthworks and how to establish perennial systems known as food forests that provide a sustainable food, medicine, fuel, and fodder source by utilizing the 7 layers of a climax forest. Get introduced to the history and basic movements of the Brazilian dance-fight-game. Experienced capoeiristas also welcome! Playing with devil sticks aka flower sticks aka juggling sticks! All skill levels welcome. Breaking down domain theory and how it applies to constructing hybrid moves. Includes breath work and a soul and laughing meditation. Grab a friend and get inside a big hoop- it’s tandem hooping time! Exploring the dimension of time with hoops. Games for heightened awareness of your surroundings in nature and anywhere! Based on the work of martial arts champion Scott Sonnon, this class takes elements derived from ancient Russian techniques used by the KGB that focus on healing, maintenance, and sending blood flow to joints rather than muscle groups. Get your acro yoga flow on with accomplished practitioners Jenna and Mark. Bring a yoga mat! Intuitive vocal exploration and finding your voice- especially if you haven’t found it before! 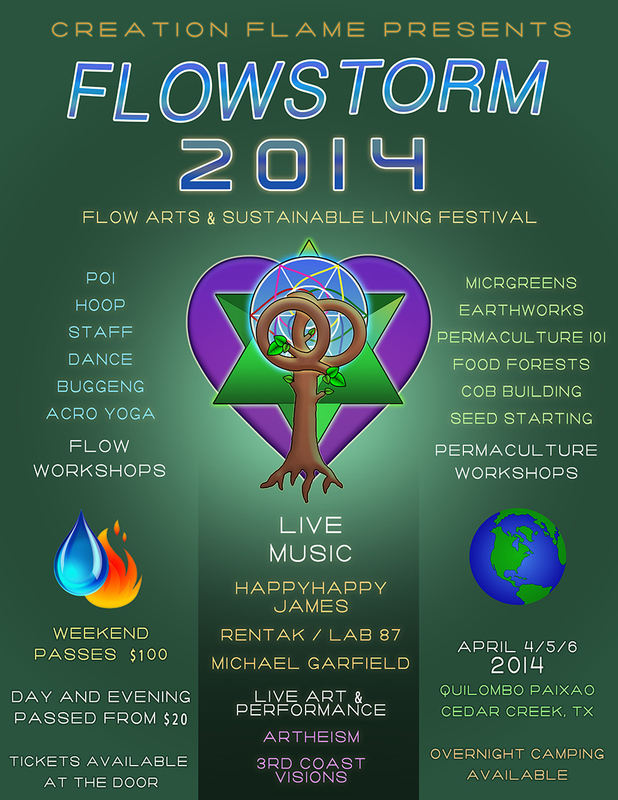 A meta discussion of how Permaculture can flow into every facet of our daily lives. Introduction to the amazing natural building material- cob. An introduction to Permaculture and how it is being used for community involvement and earth transformation, by two of the founders of the Austin Permaculture Guild. Explore the balance between leading and following, and how to heighten the magic of partner dance and partner flow. An exploration of the awesome prop known as meteor. All skill levels welcome. Bring a meteor or 2 poi if you have them! Exploring the dynamic between the audience and the performer, with veteran tips for how to make a strong connection with your viewers as a performer. A powerful Qi Gong breathing technique, used in a group format to ground intentions and manifest great shifts in our lives.